There’s always plenty to do at Middleton Elderly Aid. 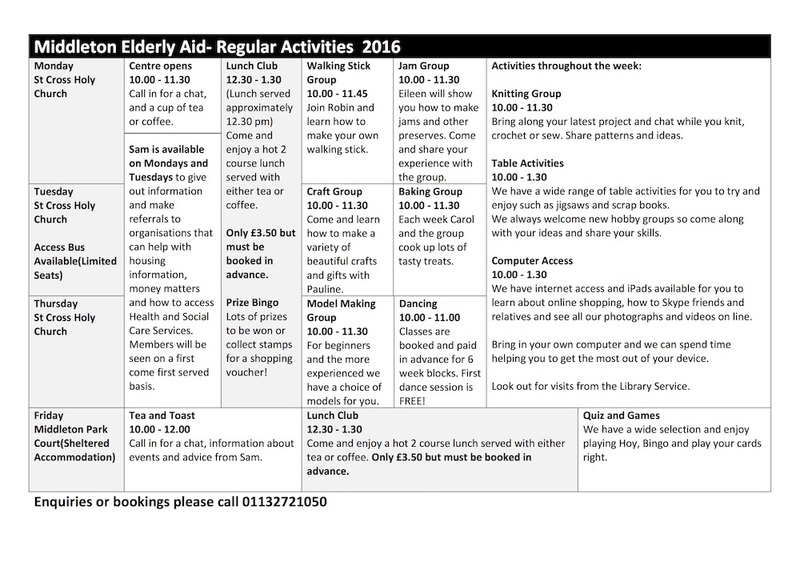 We run a programme of regular weekly activities which has something for everybody. Activities take place at St Cross Church Hall, Middleton Park Avenue on Mondays, Tuesdays and Thursdays; and at Middleton Park Court, Middleton Park Green on Fridays. Pop in for a cup of tea and a chat, for learn a new craft such as making walking sticks! Hot meals are served on Monday, Tuesday, Thursday and Friday; at just £3.50 to a two course lunch plus bingo they are a bargain, but please book in advance.